Fratton Park is the venue as Rochdale take on Portsmouth in League 1 on Saturday afternoon, with kick off at 3pm. The hosts currently hold fourth spot and have a game in hand on most of the teams surrounding them as they sit three points from an automatic promotion place and one point ahead of fifth placed Charlton below them. Rochdale have a relegation fight on their hands as they occupy nineteenth position, just two points above the bottom four. Portsmouth have not lost in any of their last five outings, winning all five (including penalty shoot-outs) and keeping two clean sheets. Following a victory by three goals to two in an enthralling encounter versus Walsall in mid March, Portsmouth then saw off Scunthorpe United on home soil four days later as Jamal Lowe and Omar Bogle netted the only two goals of the ninety minutes. The next week, Portsmouth repeated that scoreline when they faced off against Shrewsbury Town, the only difference being the goalscorers and the destination of the match. In the EFL Trophy Final, Portsmouth beat Sunderland on penalties after the game had finished 2-2 after extra time, while their most recent fixture ended 2-3 in their favour versus Wycombe Wanderers. Lowe is currently the top-scorer at Portsmouth having found the net thirteen times up to now, two more than Ronan Curtis who hold second spot on the charts. Low can boast two goals and one assist his last four appearances with each goal involvement arriving in separate matches, while Curtis has one goal and one assist in his past eight games for the team. The 23-year-old Irishman sits atop the charts for assisting with eight to his name, two more than both Oliver Hawkins and Gareth Evans as the pair are joint in second place in that respect. Rochdale have been beaten just once in their last five games, winning twice and drawing twice during that time. A goalless stalemate with Oxford United in March was succeeded by a comfortable 3-1 win upon the visit of Scunthorpe United eleven days later. 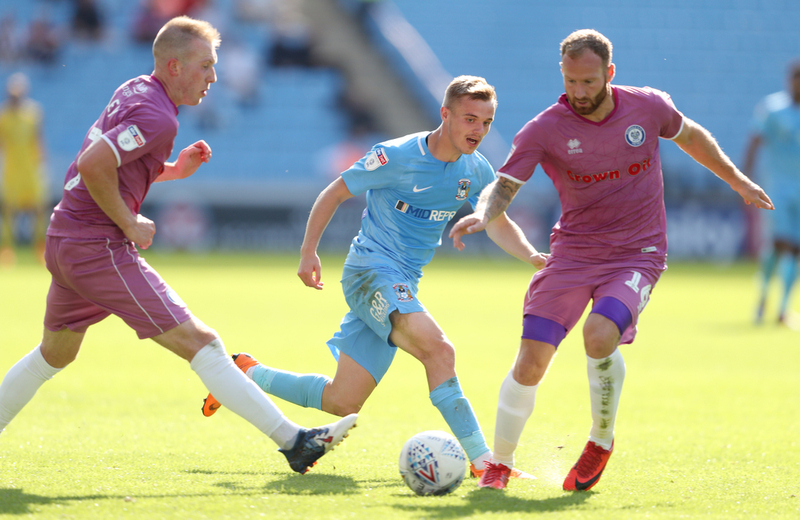 When Rochdale made their way to Gillingham, the two sides shared the spoils as Mark Byrne equalised after Ian Henderson had given the visitors a one goal lead in the first half. Their first game of April ended in disappointing fashion as second placed Sunderland came out on top by two goals to oneat the Crown Oil Arena despite Henderson handing his team the lead for the second game running just before the half hour mark. In Rochdale’s most immediate encounter, they defeated Accrington Stanley by a solitary goal scored by Oliver Rathbone. 34-year-old attacker Ian Henderson hold the number one spot on the scoring charts for Rochdale right now with eighteen goals in the league, two of which have come in his last three appearances for the club. If not for him, the club would be almost certainly relegated by now, as his nearest competitor for top spot on the leaderboard is Rathbone with just four goals on the board thus far, and Henderson has also been the main supplier of goals when teammates have gotten on the scoresheet with five assist up to now, two more than both Stephen Dooley and Bradden Inman.